Dogs Who Are Addicted to Television? Apparently, They Exist. A dog looking at a TV screen is not an uncommon sight, but when the behavior becomes obsessive, it’s time to call the vet. How can dogs possibly be addicted to TV if they can’t even tell what’s happening on the screen? The surprising truth is that dogs actually can see what’s happening on television or computer monitors. Without getting too scientific, I will just say that TV images are just that — snapshot images flickering across the screen fast enough that they appear to be a constantly moving image. Remember those flipbooks you made in school? It’s the same concept, really. 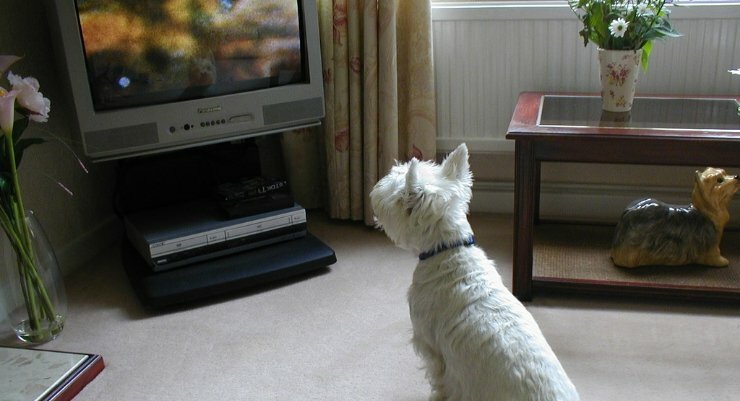 Our 4-legged friends have much better eyesight than we do, so on older television sets, they saw the “flicker” effect. On newer television sets, though, images move faster — and even to a canine, the images on newer, high-definition (HD) TVs appear to flow smoothly. Don’t Miss: Are Cats and Dogs Color-Blind? Noelle La Croix, DVM, Dip. ACVO, also agrees. HD TVs “project images that appear fluidly to a dog,” the veterinarian says. Some people leave a television set or radio on for their dog or cat when running out to do errands, claiming that it helps their pet feel less alone. You’ll also commonly find your dog lying beside you as you’re catching your favorite show. But what happens if your pet becomes a TV addict? Is that even possible? 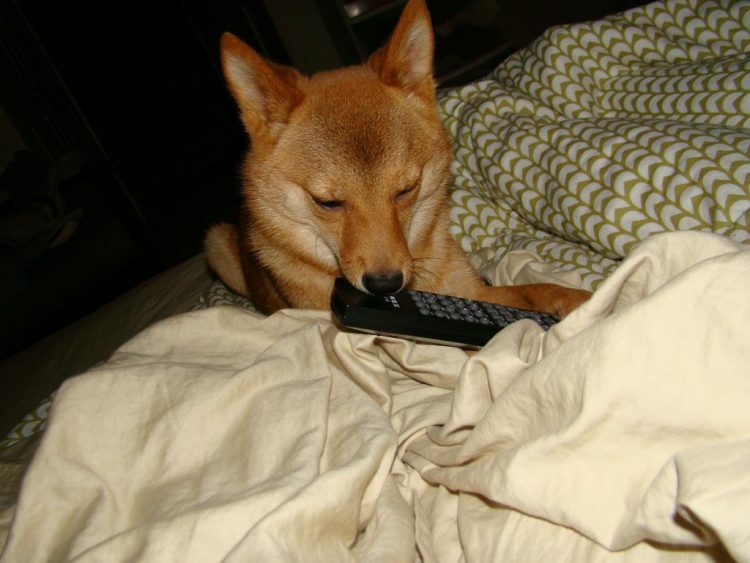 Well, some pet caretakers claim their dog has become just that — addicted to television. Some people say their dogs would sit for hours in front of the television, just waiting for it to be turned on — once it was, those pups would not move. Others say their pups have aggressive behavior triggered by television programming, such as seeing another animal, so much so that the pup would attack the TV set. Still others claim their pups hear the TV being turned on and race in from wherever they are in the house — even if they were outside. One woman even claims that her dog knows what time a certain talk show goes on the air and will bark incessantly until the set is turned on. On the weekends, the woman says she’s forced to turn on the TV and flip through all the channels just to prove to her dog that the show isn’t on. I’m not aware of any official studies on dogs becoming addicted to television, but dogs have been known to display general obsessive behavior such as becoming fixated on cats, other dogs, inanimate objects and so on. So it seems logical that if your dog can indeed enjoy television the same way we can, addiction is possible. Although this may seem great if you have a dog who is what I (not so) affectionately call “a runner” and who can be recalled by simply turning on the television, there are downsides to this sort of behavior: Just like people, if dogs don’t get enough exercise, they get fat. Lying around on the couch all day watching TV isn’t good for us, and it’s not good for your dog, either. Dogs need exercise and a healthy diet to live longer and stronger lives. If you think your dog might be obsessed with your television, talk with your veterinarian. I say it all the time: There really is nothing too silly to ask vets; they’ve seen and heard it all, and you probably won’t even make their top 50 list of weird experiences. You know your dog better than anyone. If you come home and your pup is staring at the TV with her paw on the remote control, it may be time to make that call — preferably before she figures out how to start ordering from the Home Shopping Network.